Photo by Unsplash via Pixabay (2016); Photo edited and text added by Erin Franco. This post has been readers’ all-time favorite marriage post on Humble Handmaid, so I refreshed the post for you and decided to link up with CatholicMommyBlogs.com for World Marriage Day 2016, which happens to fall on Valentine’s Day this year. Head over here to check out many other marriage posts from top Catholic mom bloggers. The Domestic Church movement for sacramentally-married Catholic couples began in Poland about 40 years ago–with the enthusiastic support of a certain not-the-pope-yet Pope St. John Paul II. Domestic Church gives couples lifelong formation in personal, marital and family spirituality. Michael and I went on the introductory Domestic Church marriage retreat at a low point in our marriage–perhaps the lowest point of our marriage so far. Severe financial and personal stressers had driven us deeply apart. 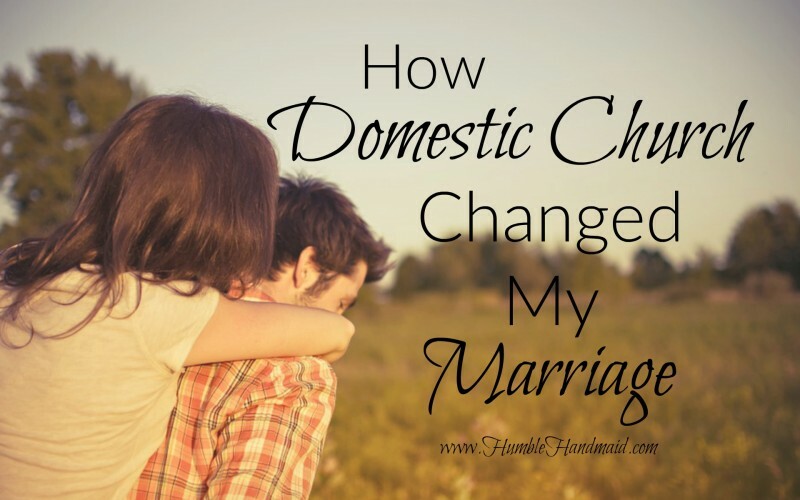 I remember there were weeks during that season of my life that I was so angry and confused that I could barely look at my husband, let alone have a safe, honest conversation about how we were doing as a couple. We had heard about Domestic Church for a couple of years, because we are close friends with David and Kate Dawson, the couple who are responsible for bringing the movement over to the United States a few years ago. We had listened politely for a couple of years to David and Kate’s enthusiastic descriptions of Domestic Church and its fruit in their own marriage, but we weren’t interested. Looking back–and I’ll be honest–there were two reasons for that. First, Michael and I were not “movement” kind of people–or so we thought. We were wary of that term for some reason. Secondly, I don’t think we were interested up until that retreat because we hadn’t encountered enough struggle yet. I think we thought we could handle whatever life threw us in marriage with a little time to shake it off, all the good intentions in the world, and some old-fashioned Love Is All You Need. As with many things, necessity was the mother of a change of heart. Like I mentioned before, we weren’t doing so well that fall before our retreat. Without going into the gory details (literally), the entire year had been one major stress after another, and the previous couple of years had been stressful as well with new babies and job changes and incredibly scary leaps of faith. We were in severe debt, were living indefinitely with my parents by necessity (our three small children in tow), and we were at the end of our rope emotionally. Clinging to my faith and trying to keep Michael connected with his, I had begged him to go on a men’s retreat at the beginning of the fall. After his retreat, he told me that he would go on a marriage retreat with me. He actually changed his mind soon after that as the afterglow of his retreat faded in the face of our struggles at home. But I informed him that I had already signed us up and paid for the Domestic Church retreat (and God reward the family who sponsored the scholarship for our retreat!). Sorry babe, we have to go now. I don’t usually recommend that wives nag and drag their husbands to marriage retreats, but in this case, it was a Godsend of a move for us. Neither of us arrived at the retreat center that weekend planning to “do” Domestic Church, but after the first evening of talks and prayer, we looked at each other square in the eye for the first time in months, and confessed to one another that the Holy Spirit was whispering the same thing to each of our hearts: I want this for you. More than two years into our journey with Domestic Church, this movement has been a great, great gift to our marriage. God used Domestic Church to begin a slow, but sure healing process that has unified Michael and me through the simple and faithful practice of our faith–together. We don’t have the perfect marriage, and we won’t be writing a book any time soon about how to have the perfect one. What we do have is good foundations, built on habit and faithfulness rather than just ideals or nice ideas. What we have is the gentle accountability of our circle and priest–and one another–to help us keep always trying, trying, trying to connect with one another and with God, and not give up. I want to share some of the nuts-and-bolts of Domestic Church, so many of which are surprisingly familiar, basic spiritual habits that don’t reinvent the wheel–they just actually use it. Daily personal prayer, couple prayer, daily study of Scripture, daily family prayer (and no specific prayers or ways you have to do it). Basic, fruitful, and surprisingly difficult sometimes! For this post, though, I want to focus on the prayer commitments of Domestic Church that were most helpful for healing my marriage. First off, so often Christian couples have very separate and different prayer lives and spiritualities. That sure was Michael and I, and to a great extent, still is. Couples just don’t have a place to meet in the middle spiritually. To keep God at the center of your marriage, we learned–and are still learning–that you have to talk about God together as well as to God together. Domestic Church has given Michael and me several powerful ways to intentionally, habitually meet in the middle with our faith lives, literally and spiritually. One commitment couples make with Domestic Church is to plan a date once per month for a marriage dialogue. Often, issues flare up in marriage at times when one or both of you don’t have the energy, state of mind, or right disposition of heart to have a fruitful conversation. For a few days before a marriage dialogue, we pray individually about the conversation we will have, and we each work on a list of things we need to discuss. We actually bring a written list of things to cover when we go. The monthly marriage dialogue has given us a space to come together consistently and prayerfully to work out our problems, to plan out how to overcome obstacles, and to really listen to how the other person is doing emotionally and spiritually. Another place we meet in the middle now comes with the monthly circle meeting. We meet with a group of six other couples–and a priest–to share the ups and downs of life, to pray with and for one another, to share how we have been doing with prayer, and to discuss a new piece of spiritual formation. There are six other couples–and a dear priest friend–who really know us. Who in our struggles and failures and successes, know our hearts. That is a gift. The third and most important way that Domestic Church helps Michael and me to meet in the middle is through our commitment to daily couple prayer. Yes, we pray every single day together. It is not always profound, or easy, or even comfortable. Praying out loud was difficult for us at first–particularly for Michael. Honestly, we still have trouble sometimes in couple prayer! I have so respected Michael’s daily effort to overcome his shyness in prayer. And in the process, I have learned to pray with more simplicity so that I don’t “take over” our prayer together as much. I think he appreciates that in turn. We usually include in our prayer praying aloud spontaneously about what is on each of our hearts. Praying like that brings out the fact that you don’t really know everything going on in your spouse’s heart without prayer. I’ll admit that sometimes praying with Michael is the last thing I feel like doing. Prayer is intimate. In my anger or my hurt, sometimes I don’t want to let my husband in like that, and vice versa. And sometimes it’s difficult to pray when you don’t know if you have the words to explain what’s going on in your heart. But at the end of day, Michael and I choose to zoom out, to be faithful to couple prayer, and to keep trying. God multiplies that kind of faithfulness. Grace acts as soon as the soul cooperates. For Michael and me, the prayer commitments we’ve made with Domestic Church have helped our souls to cooperate with the grace of this very difficult, very beautiful vocation to marriage. We don’t have a perfect marriage. We don’t do all of our prayer commitments well. But we’re getting better, little by little. Having to admit to a group of wonderful couples (now dear, dear friends) that you didn’t pray much together last month because we’ve just been lazy is a helpful kick in the pants when you start to slip. Domestic Church helps married couples utilize the grace of their sacrament. It’s that grace that we read about in marriage prep, the grace that we desperately hope is there when disillusionment and struggle try to settle into daily life, and the confidence and hope of our wedding day seem far away. The Domestic Church movement believes that a grace-filled marriage overflows–into grace-filled families and grace-filled communities. That’s the long and short of it–and the beauty of it. There are many movements, devotions, and special practices that can help us have a holy marriage and family. Domestic Church happens to be God’s plan for enriching our particular marriage. When you have found something wonderful, so often you can’t wait to share it with others, right? That’s how Michael and I both feel about Domestic Church. I am glad to share this post again this year, as well as point you to two fantastic episodes of “The Right Heart” that I’ve recorded with Kate and David Dawson, the national couple for Domestic Church here in the United States: One on the history and basics of Domestic Church, and another one on Couple Prayer. Erin, thank you so much for this testimony! I was reading and crying…God is so amazing! Hope to meet you in September! In Baton Rouge. Erin I am not sure if you remember me… My husband, Keith, coached Gabe's soccer team. I have been reading your blog for a while now and really enjoying it. But when I saw your post tonight I knew it was God speaking to me. On Friday a friend in my Rosary was telling us about the Domestic Church that her friend was in. We were all really excited about and wanted to find out more information. I looked at the http://www.domesticchurchfamilies.com that night. We were under the impression that this was tied to a specific church. But the more I read it does not sound like it. I guess we need to sign up for a retreat to get the ball rolling. Katherine, I definitely remember you! How small the world is. I wish Gabe had been more interested in soccer…he was maybe too young when we put him on the Y team. He just stood around and scowled a lot of the time, especially during games. Oh well. He was only 4. 🙂 I was so impressed with Keith and the other coach. They were absolutely wonderful with the kids and did a great job with practices and games. So on to DC. :) Go to the Events page on the DC website (http://www.domesticchurchfamilies.com/#!event-calendar/c786) and you can sign up for the upcoming retreats directly from there. They are three-day retreats. Just print out the form and send in the registration by mail or email. The next one is May 28-31 in Lake Charles, and the next one after that is August 27-30 in Ponchatoula. David and Kate Dawson are the couple who give the retreats, and they are so laid back and are also really, really funny. You guys will love them. They are dear friends of ours. Domestic Church couples ideally are all from the same parish. Eventually in the formation, couples discern what their gifts are as a couple and how they can share their gifts in their marriage with their parish in some way. If you have some friends who are interested, definitely send them the link to the site and the dates for the upcoming retreats. You can also feel free to give them my email and they can ask me any questions they might have. You have to have 4-7 couples for a circle to form. The website does a good job of explaining the basics of DC, but please feel free to email me (humblehandmaid@gmail.com) if you want more info on Michael and I's experiences or have any questions! We are the lead couple over the Baton Rouge area, so we help answer questions and coordinate new circles here. Hey, Erin!!! Do they have Domestic Church on Southshore? Also, where can I find out more about the retreat? Sounds awesome! Yes, ma'am! Go to http://www.domesticchurchfamilies.com and click on Retreats/Events. Also, read up about DC there. The website has excellent explanations of the basics. Couples go on the intro retreat before joining a circle (they place you in a circle of other couples, preferably from your same parish if possible). The next retreat is May 28-31 in Lake Charles, and then the next one after that is scheduled for August 27-30 at Rosaryville in Ponchatoula. Feel free to email me or even to get my number from Frances if you have any other questions! I'd be happy to catch up. YAY, Ali!!! You and Matt are going to love this. It's so simple and solid. Girl, we have got to get together sometime!